One of the smallest towns in Republic of Macedonia, Bogdanci, is located in south-eastern part of Macedonia, eastern of the nearby town of Gevgelija. It is the seat of Bogdanci municipality. According to the 2002 census, Bogdanci had 6,011 inhabitants. The town lies at an altitude of 80-100 meters above the sea level. This small town of Bogdanci is situated very near the E-75 international route and can be reached from the junction at Gevgelija on E-75. Gevgelija is just 10km away while Skopje is 170km away and Thessaloniki (Salonica) is 80km. The good geographical position of Bogdanci in the ravine, the traffic importance and the economic function in the region are the reasons that Bogdanci was and still is a dynamic hearth for the gravitation of the settlements from the Dojran and Gevgelija ravines. In the past the traffic was not developed enough and that's why the relief was the main factor for the intensity of the gravitation occupy in some ways. 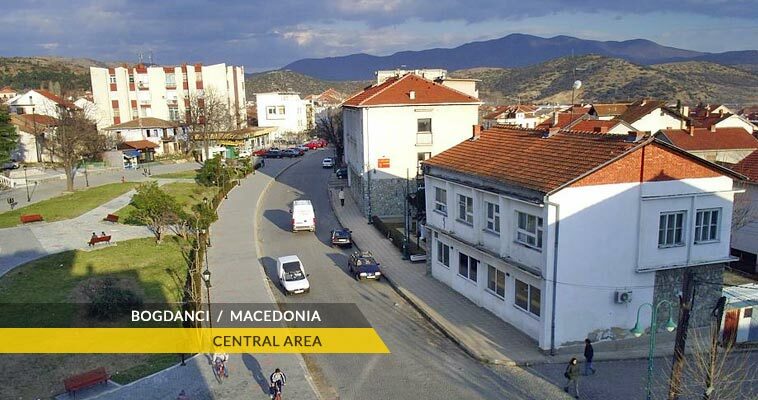 Most villages of the region that were well connected with Bogdanci gravitated in every sphere with it. From the other side Bogdanci gravitated well with Salonica, the center of Macedonia in that time. Today with the development of the ravine's center Gevgelija the gravitation occupy of Bogdanci is shrank. Bogdanci geographical is under strong influence of the mediterranean climate that enters by the River Vardar valley from the Aegean Sea, from south. The power of expression of the Mediterranean climate influences in Bogdanci is bigger in summer than the winter. During the winter the people in Bogdanci feel the cold continental climate that comes from the north. This is the difference between the "modified Mediterranean" climate here from the one on the Adriatic Sea. The years average temperature in this region is 14.5°C.